Pro triathletes demanded ultimate ventilation and faster transitions, so Specialized developed the Trivent SC with performance-enhancing, tri-specific features, plus Body Geometry ergonomics. Women's contoured Form Fit for ultimate connectivity and power transfer. Powerline carbon/composite sole for light, stiff power transfer: Stiffness Index 10.0. Thermobonded construction for a smooth internal lining for "sockless" fit and comfort. 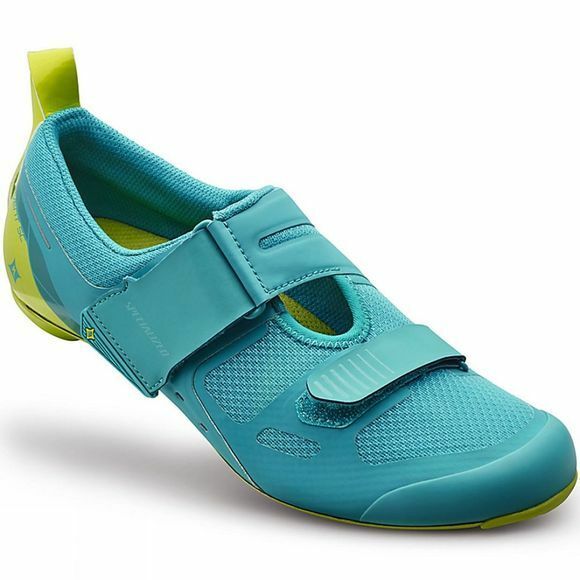 Large, looped heel pull keeps tab accessible for easy shoe changes in transitions. Debossed fold lines allow for easy shoe flattening for flying starts. Supple upper with open-air mesh for maximum ventilation. Wide closure system allows for easy entry/exit and disperses forces through the shoe for a comfortable and secure fit. Rubberized heel for increased traction during transitions.